A couple of posts back, I mentioned coming upon a new Dean Koontz book in the grocery store and impulsively buying it, seeing as it filled a need I had decided I had that same morning — the need for a good book to read that would keep me from getting too active and exhausting myself in my “recovery” from surgery. That book was What the Night Knows. I love the title. And the cover! As I also mentioned, I read pretty much all that afternoon — not straight through the story, but skimming over all the “irrelevant” scenes to find the answers to questions I just couldn’t wait for. AFter all, I wasn’t “officially” reading the book yet, just dipping my toe in the water. In this case, it was a good thing, because I was hoping something would happen that didn’t, was in fact, the opposite of what he was doing. After that, other things, including continued bouts of tiredness, took up my time and I made minimal progress until this weekend. Starting from where I began skimming, I read it all the way through and finished it last night. The story begins with their father, Detective John Calvino, investigating the recent group-murder of an entire family that eerily echoes in numerous precise details the first of a string of family murders that occurred twenty years previously. John’s parents and sisters had been the fourth family to die in that previous string, before John himself, at age 14, shot the murderer dead in their home. Now he increasingly comes to suspect the ghost of the original murderer has somehow come back from the grave to start anew, and he fears his own family is on the list of new victims-to-be. There was much to ponder as I read, and after I finished, as well. Koontz explores the depravity of man, demon possession, the intervention of God, guilt, sacrificial love, and redemption — this latter not, I’m sorry to say, through the agency of Christ, but rather a man’s willingness to lay down his life for his family as a sort of penance… But regardless of whether I agree with Koontz’s position there, it still draws my thoughts to the subject and provides occasion for contemplation and clarification of my own understanding. One of the things I was particularly interested in was the unfolding of what is in essence a spiritual battle against forces of evil, a battle our culture has managed to delegitimize. Battles against evil spirits and tales of possession, vampires, etc, might abound in movies, books and video games but mostly people don’t believe any of that is real. Granted the true battle is largely invisible and involves thoughts and words more than the physical attacks of a possessed psychopath, but even an invisible battle is difficult for many to swallow, perhaps because the physical battles as portrayed in the above mentioned outlets are so outside of anything they’ve ever seen in real life they can’t help but throw the baby out with the bath water. Koontz played off this reluctance to believe in supernatural battles. When John is finally forced to tell his boss not only what he suspects but why (to explain why he has been breaking regulations in the things he’s been doing) his boss immediately assumes he’s having psychological problems and gives him thirty days’ leave. He then gives John the name and number of a psychiatrist who is a “good man” and will be able to help him. John’s partner later comes to believe the threat is real, as do all the members of John’s family who have each experienced their own encounters with the evil spirit. Naturally, the reader does as well, having been present with each viewpoint as the story unfolds and in that experience willingly suspending disbelief. Late in the tale John speaks to another priest, a defrocked former exorcist who does believe in demons and evil. The ex-priest brings up the matter of divine interventions in delivering people from demon possession, implying that is the only real hope he can offer John in the matter. He even points out the disparity that exists between believing that a demon might actually be tormenting them, but not that God might also be present and willing to deliver them. Or, slightly less antagonistic, believing only in a God who is impersonal, remote and primarily occupied with things other than what’s going on on earth. Oddly, in the end Koontz seems to buy into the latter notion, for even as he writes in some detail of the personality, motivations and nature of the demon, who is extremely up close and personal with his victims, God on the other hand is portrayed as largely uninvolved, deigning to intervene only occasionally and only in the most dire circumstances — though even in those He is not consistent. When He does intervene, He does so by means of proxies — either “innocent” children or loyal animals or both — and apparently requires some sort of worthy action on the part of at least one party among the rescued. In fact there is much made in this story of innocence and purity being the protection against possession, while sin and weakness and deception are the doorways for it. By this template, any adult or adolescent male child can, almost at any time, be possessed, if a demon is about. We all have weaknesses. We all sin. We are all deceived in some way or other. Only the truly saintly, of which there are almost none, says the former exorcist, can be assured of protection. This is the God of religion, I think. The God of the natural mind, for the natural mind always wants to make things hinge on itself, on things the creature has done, rather than celebrating what the Creator has done. On the power and integrity of the creature rather than that of the Creator. More and more God is showing me that it is the latter that is the only thing that really matters: What He has done. Who He is. And that is not the message of this story; instead it celebrates the basic goodness of a man, the power of human love and a man’s decision to sacrifice for his family. That is what we are to applaud. 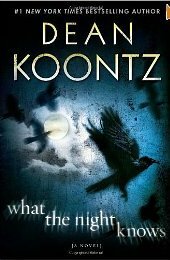 It is a common theme in Koontz’s work, and, I’m sure, one of the reasons he has become a best-selling novelist. But ultimately, man is not basically good, human love is weak and while self-sacrifice is laudable, it’s nothing compared to the sacrifice of the King of Kings and Lord of Lords, particularly when you consider that it was done for those who were at the time His enemies. This entry was posted in Angelic Conflict, Book Thoughts and tagged Angelic Conflict, Dean Koontz, demonism, good vs evil on April 30, 2012 by Karen Hancock. You’re right. I thought many of the same things when I read it. I keep being drawn back to Koontz because he is great at what he does. It does bother me that he often gives God such a bum rap, but I always allow my thoughts to be drawn to the Truth, whether or not he is pointing it out.